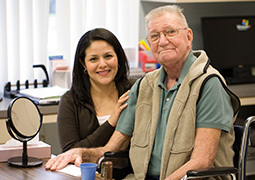 Here at Mission Care Group, we understand that their are many choices available when it comes to choosing the right rehabilitation center. We encourage anyone seeking care to schedule a tour at one of our locations to see what sets us apart from others. Our friendly and caring staff is available to answer questions and perform a guided tour. When you or a loved one is ready to enter into the admission process, our team is here to assist with every step. Whether you are pre-arranging admission for a scheduled surgery before a hospital stay or working with a discharge planner in an acute hospital, our team is here to make this a comfortable and smooth transition for all. Upon admission, each patient will receive a personal care plan developed by our Care Partners, physician and loved ones. This care plan will allow us to provide quality care to get each patient back to the life they once enjoyed. Please contact us if you or your loved one is in need of assistance with admission to one of our locations.